Gothenburg, September 30, 2017 already marks a milestone in Sweden’s anti-racist history. Weeks of boasting and threats from the Nazi “Nordic Resistance Movement” (NMR) ended in them not even reaching their assembly point. Instead they were surrounded for several hours before finally sneaking back to a car park to leave Gothenburg with 35 arrested Nazis less. Days and hours before the demo the media acted shamelessly in alliance with the police against alleged left-wing extremists in order to scare away all those who wanted to demonstrate against racism. Liberals and right-wingers made endless speeches in favour of the Nazis’ right to “free speech”, declaring demonstrations against Nazi marches as counter-productive. In a secret report that leaked to the media, the police warned of “confrontations and clashes” – “from different groups”. It sounded almost like Donald Trump’s statements after Charlottesville, where he spoke of violence from “many sides”. The weekend before the march, the Gothenburg police announced plans to build temporary arrest cells in the basement of their headquarters – 60 cages with room for 350 people. Virtually all major media reported that the police predicted “riots” and “violence”. But it was not the Nazis that the police warned of, but violence “around” the Nazi march. The Nazis first got police permission for the march to start outside the major national book fair and then pass not far from the synagogue – this during Yom Kippur! After major protests, their march route was shortened. The police also gave out instructions to the Nazis – the police themselves called it a “flyer” – on how the Nazis should behave in order to avoid arrest. Among the police’s tips were that the Nazis should not have flags, shields, give collective greetings, carry right-wing symbols or march in a military manner. But immediately after the police published their call, on Sunday, 16 September, 50-100 Nazis marched without permission with shields, flags and Nazi symbols through Gothenburg’s main street. For the Nazis, this was a show of strength. For everyone else, it was a signal to step up the many campaigns against them. Our campaign reached schools, local trade unions, tenants’ associations as well as being publicised on the streets. We launched committees for Students against Racism and members were invited to speak at meetings, for example with Kommunal – the council workers’ union. Contact with the Teachers’ Union was an important part of the mobilisation. We could feel that the support was strong and knew the establishment’s attempt to put a brake on the protests would fail. And on the day, 30 September, nothing prevented the masses from turning up and pouring into the meeting point – Heden. There were new and more experienced anti-racists, young and old, white and black and coming from the north to south. It was absolutely amazing. Up to 20,000 people turned up and stopped the Nazi march. Banners such as “Railway Workers Against Racism”, “Tram Workers Against Nazism”, “Students Against Racism”, and “Folk Musicians Against Racism” alongside the Teachers Union banners were all around the field. There were also dock workers, council workers, tenants’ association activists. Yes! There were all kinds of anti-racists. This is what happens when Nazis are given “permission” to try to abolish freedom of expression for everyone else. We have to act to stop them; and we did! A terrorist organisation like NMR – that used lethal bombs against two refugee camps and a syndicalist office here in Gothenburg last winter – should definitely not be allowed to march and abolish everyone’s safety. Heden – the big field where the Nazi march was supposed to pass by – was easy to move in and out of. The Gothenburg police, plus 1,000 extra police officers from other parts of the country, guarded the Nazis and their planned march route. Rättvisepartiet Socialisterna (CWI Sweden) had three stalls and a tent at Heden which were all well-attended. There was a very high demand for anti-Nazi badges and nearly 250 people bought our paper, Offensiv, with the front page headline: “Everyone to Heden – Stop the Nazi March!”. Around the city, there were in total twelve different anti-fascist demonstrations and protests. At about 1pm, protesters began to approach different streets close to Sten Sturegatan where it was planned that the Nazis would march. 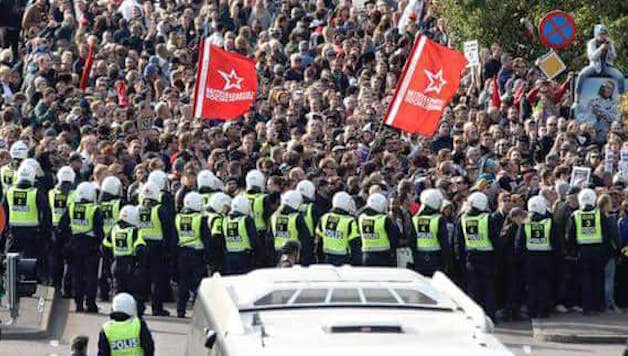 When reports came that they were stuck at the Focus House near the Liseberg amusement park, Rättvisepartiet Socialisterna took the initiative in leading a demonstration from Heden and moving towards Liseberg, first with a couple of hundred and growing to thousands of people. When we arrived we saw Nazi flags behind the police barriers. Many other anti-racists followed our chants and speeches through the loud-speakers on our portable audio system. “No streets, no square, for Nazis in Gothenburg!”. The violence that occurred came from the police who, without warning, brutally tried to push us back, even with horses. In spite of police violence, there were very few anti-racists who chose to throw anything – a good sign of a high consciousness of how to keep things together. Police on-site also told the daily Gothenburg Post, “The stone throwers were very few”. Afterwards it was revealed that among those who threw stones and smoke bombs were right-wing extremist provocateurs who attempted to infiltrate the demonstration to create chaos. The mass mobilisation created such pressure that the police were forced to block the Nazis’ march. Such a great anti-racist victory like this cannot be discredited by the fact that a few people were throwing things. After thousands of anti-racists gathered to block the Nazis at Liseberg and the police were forced to redistribute their resources there, anti-racists celebrated at Heden and poured onto the streets intended for the Nazi march shouting “Victory!” and “We’ve won!”. That we were so many – one of the biggest demonstrations against racism and nazism ever in Sweden – also put pressure on the police and the media. “Gothenburg sent the Nazis home” was the Post’s headline the following day. “Nazi fiasco,” wrote the Expressen, and “The worst fears were not realised, Gothenburg defeated the Nazis with clarity and celebration,” wrote another Gothenburg daily. At the same time, the establishment will attempt to downplay the role of the counter-demonstrators and instead say the police stopped the march! Another factor was the Nazis’ violence. They were so violent that they started the day by attacking the police, trying to reach an alternative road, and became fenced in. The extent of the demoralisation this means for the Nazis is shown by the internal splits already appearing on the so-called Nordic Resistance Movement’s website after the failure. The Nazis are deeply disappointed that they were so few – less than 500. In the preceding weeks they had claimed it would be the largest Nazi march in Sweden since WW2. Their leader, Simon Lindberg, was among the first to be arrested. This can have a big effect on general consciousness. The mood in Gothenburg is one of victory – the fascists were stopped! The establishment fears any movement from below that can challenge their neo-liberal policies, including their policies of mass deportations of refugees. The biggest movement in Sweden this year has been a 58-day sit-in strike of young Afghan refugees protesting against deportations. Combined with the mass demonstration in Gothenburg, it is a big challenge for the right-wing parties and their power. The Social Democrats are isolated and exposed by the fact that they tried to limit the demonstration. Firstly they called their own protest with the other establishment parties – the day before the march! Secondly, their youth organisation called for boycotting Heden and instead gather a long distance from the march. For Rättvisepartiet Socialisterna, this was a major campaign. For many years, our party has been at the head of preventing the Nazis from establishing themselves in Gothenburg. RS has organised demonstrations and blockades, and members have been physically attacked several times. This year’s march was a serious attempt to re-establish fascist forces in Gothenburg. Together with ‘Students Against Racism’, we put forward a socialist view in our campaign. In numerous articles and leaflets we have explained that as a result of poverty, increased inequality, cuts, mass unemployment, wrecked welfare and the absence of a socialist mass party fighting against the racist Swedish Democrats (SDs), they have been able to increase their support. They are now the third or second largest party in opinion polls. In the tracks of the SD, the more violent Nazi movement has been able to widen its support. In short, we can say that the right wing policies of successive governments opened the door for SD, which in turn paved the way for the fascists. The combined left, social and labour movements must therefore create a powerful counterforce. To stop the Nazis from growing and marching is self-defence, but we also fight for a political alternative, a workers’ and socialist programme. The capitalist parties’ unity can never stop racism and fascism; it is their policies that create the basis for these forces. We therefore stand in direct confrontation with liberal anti-racism, which confines itself to moral condemnation of ideas and attitudes, but ignores class conditions. They stop at pointing to racism as a matter of stupidity and ignorance in order to prevent real debate, struggle, and common mass protests from below. Anti-fascism is not about violence; our strength is in our numbers. But we have the right to use the force needed in self-defence. Socialists stand for peaceful and well-disciplined mass action. We fight the state’s violence against migrants and refugees and the structural racism that affects minorities. We fight the street violence and open racist attacks of the fascists. We do not trust the police and government agencies to do this for us. They have repeatedly shown themselves to be on the other side. We call for trade unions, anti-racist and social organisations to organise effective stewarding at activities, meetings and demonstrations. We reject methods such as unprovoked violent attacks of small groups and individuals, which counteract the purpose, discredit anti-racism and give the state an excuse to attack us. The anti-racist movement needs to grow and we have to ensure that more people take an active part in it. Now, after this victory, we have to build on the spectacular success and organise. The Nazis will be stunned for a while. But it is the policies of the main parties that have given them possibilities to grow and these must be combated. In Gothenburg, we aim to continue building groups among the students, tenants and others who were at the demonstration. We want to build a new democratic network against racism and Nazism in Gothenburg and nationally, as well as building our socialist party. Next articleSpain/Catalonia: Historic General Strike in Catalonia. Out With the PP Government!